Well, the happy little elves at Fruits de Mer have done it again, and vinyl enthusiasts worldwide are salivating in anticipation. Do you remember those juicy LPs from the 70s with side-long tracks? You are in luck. On August 21 a 4-LP boxed set of eight incredible space rock, Krautrock, psychedelic freakouts will hit the streets. This project, as most with Fruits de Mer, started out as a single track slated for their standard 7 inch vinyl release: The Soft Bombs’ faithful cover of Pink Floyd’s mammoth “Echoes.” Keith Jones tried to persuade the band to split it so he could release it as a double-sided 7 inch, but that did not fly. Then over the next 18 months Keith encountered more bands, both familiar and unknown to the FdM family, who also could not contain their enthusiasm when playing extended versions and jams. The result is this boxed set of four single albums rivaling Yes’ Tales from Topographic Oceans. To enhance the sonic experience, The Luck of Eden Hall’s Gregory Curvey designed the sleeves and labels uniting the four albums, which are individually titled Sidetracks, Sideways, Sideshows, and Sidesteps. Sidetracks kicks off the journey with the aforementioned “Echoes” by The Soft Bombs, which is about five minutes shorter (!) than Pink Floyd’s original. The Soft Bombs remain pretty faithful, but there is ample room for the band to stretch and jam. If you remember Pink Floyd’s version where it gets weird and cosmic towards the end, The Soft Bombs provides their unique interpretation to create something much more than a mere cover. The flip side is by another new FdM artist, Arcade Messiah AKA John Bassett from the UK. Aracade Messiah’s contribution is an extended version the infamous Aphrodite’s Child song “Four Horsemen,” taking it from its original 5:53 minutes to a whopping 18:54! The song begins with twin guitars in a trippy cosmic jam for about seven minutes and then things quiet down resolving into a vocoded version of the song. After five minutes, the music evolves into a metal jam on the same riff, looping back to the vocoded vocals near the end. This first LP just takes your breath away. Sideways continues the journey with two other bands: the legendary Bevis Frond and another new band from the US, Wreaths. The Bevis Frond cover is a Krautrock track I am unfamiliar with, Electric Sandwich’s “China” recorded in 1972. The original song was already hefty, clocking in at eight minutes, however Nick Salomon has tripled its length! Nick’s guitars weave in and out, stitching together the driving bass line, fuzzed guitar, wah-wah guitar, etc. actively engaging your interest, and surprising you when it is finally over. A severely edited version of this track appeared on the FdM Head Music double LP. Now the flip side is the Wreaths’ cover of Gordon Lightfoot’s pop hit “Sundown.” Who would have ever thought to create a psychedelic opus from a pop song? The music has a slow gothic western pace, not as energetic as Gordon’s original. The Wreaths’ approach was to start with the song and then after about six minutes to venture off into trance-jam territory, eventually fading off into the night after 16 minutes. 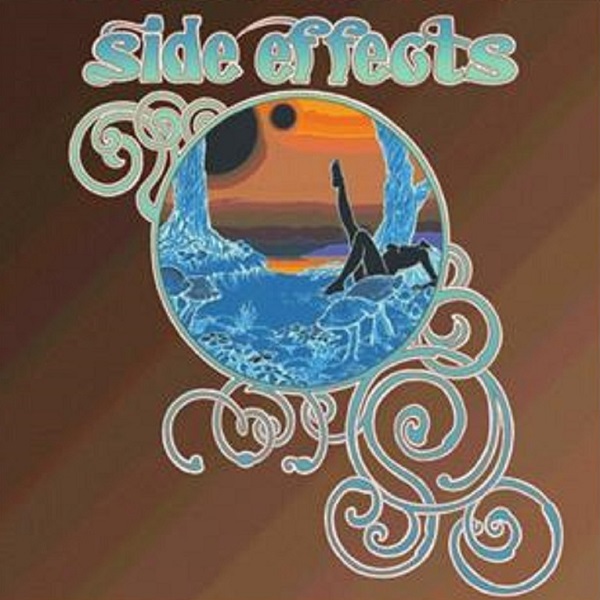 Sideshows features Superfjord who contributed to FdM’s Coltrane released last fall and one of FdM’s most popular bands The Luck of Eden Hall. For this release Superfjord chose to take The Byrds’ quirky 2:32 “C.T.A.-102” and extend it to a full 17 minutes! Unlike the other tracks on this set where the bands either covered a song or used it as a springboard, Supefjord literally stretched the song. The track begins with pseudo radio signals sending out an SOS along with other weird sounds and electronics for about a minute. Then they sing the first verse and launch the song into Krautrock/Harmonia territory with a Motorik beat. After five minutes they sing the second verse, travelling out into the universe for more extended jamming. At the 12 minute mark the third verse appears and the first line “On a radio telescope” is processed and repeated until it fades into obscurity. My only gripe, albeit very small, is that Superfjord avoided the reversed and sped up alien voices I found so intriguing on The Byrd’s original. The flip side is The Luck of Eden Hall’s cover of Yes’ “Starship Trooper.” I have to say that I was never a Yes fan, there was something about them that grated on me. Once upon a time I did own the Fragile, Close to the Edge, and Relayer LPs, but sold them. There was something about their music that struck me as being too sterile. Now, listening to The Luck of Eden Hall’s cover, I think that the version seen through their lens is better than the original. Their version has a warmth, even though trying to recapture Steve Howe and Jon Anderson is a bit elusive. The Luck of Eden Hall’s version covers the different song movements and launches into uncharted territory, seeking out new worlds, new civilizations, bolding going where no band beyond Yes has gone before. Towards the end sped up/slowed down voices and Mellotron join the mix, which slowly fades into obscurity. The final disc, Sidesteps, features Julie’s Haircut and the familiar Welsh band Sendelica. If you thought last year’s cover of Coltrane by Superfjord was bold, wait until you listen to Julie’s Haircut cover Miles Davis’ groundbreaking “Shhh/Peaceful” from his electric period! Miles and crew (Wayne Shorter, John McLaughlin, Joe Zawinul, Herbie Hancock, Chick Corea, Dave Holland, and Tony Williams) created the original jazz-fusion sound. Now Julie’s Haircut has taken it one step further by creating psychedelic-jazz fusion. Julie’s Haircut’s cover is brilliant, though their trumpeter does not quite have the Miles Davis edge to his playing. If “Sundown” was not a weird enough psychedelic departure, then experience Sendelica’s Krautrock treatment of Giorgio Moroder and Donna Summer’s disco hit “I Feel Love.” The original disco hit lasted a mere six minutes (though many longer versions appeared). Now prepare your self for an epic 21-minute instrumental! The song opens with heavily reverbed electronics, other sounds, and chimes creating an amorphous swooping and swirling texture that is nothing like disco. Suddenly at 5:30 there is a synth chord wash and a disco beat kicks in. I guess you could call this new genre psycho-disco. Sendelica slip in sax along with the electronics, guitars, melody, and chord changes. The music is excellent and there is an ostinato sequence recalling Tangerine Dream. What more can I say? Just see if you can grab a copy of this set that I am sure will not stay long on the virtual record store shelves.